Melt 1 tablespoon Cinnamon Sugar Butter Spread in 12-inch nonstick skillet over medium heat; add chicken pieces. Cook, stirring occasionally, until chicken is no longer pink. Remove from pan. Spread 1 side of each tortilla with about 1 teaspoon Cinnamon Sugar Butter Spread. Place 2 pieces cheese on half of tortilla. Top with 1/4 chicken pieces and 2 pieces cheese. Fold tortilla over. Spread each side with about 1 teaspoon Cinnamon Sugar Butter Spread. Repeat with remaining ingredients. Place 2 quesadillas into skillet. Cook, turning once, until golden and crisp (4 to 6 minutes). Repeat with remaining quesadillas. Remove to cutting surface; cut each in half. 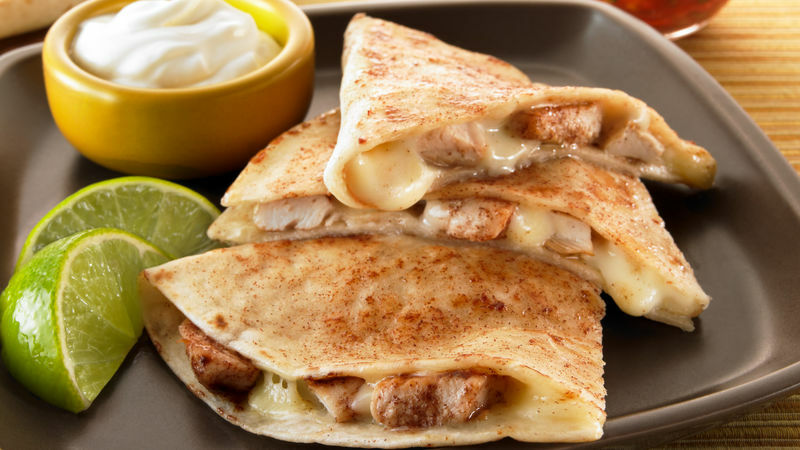 Chicken quesadillas are taken to a new level with the addition of cinnamon butter.